Skipper's blue pajamas from 1996 are fairly easy to find. 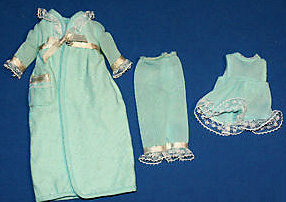 Her PJs are made of a light turquoise blue tricot fabric and trim with lace braid and ribbon. The top is sleeveless and has lace trim around the bottom. The pajama pants also have lace trim at the hem. Her her quilted robe matches the pajamas and has the same lace and ribbon trim. It has a white ribbon tie closure. Her blue felt slippers have the same ribbon and braid as straps across the top of her feet and can be very hard to find.